We meet with every client to find out how you want to use your space. We measure, we gather requirements & details. Based on what we learn from you, your preferences as well as the technical requirements; we design your project specifically for you. Once you have approved your design; we draw the detailed technical plans and prepare finish samples for approval as well. With approved plans and finish samples; we take our technical plans to the workshop and get to work building your cabinetry. Once construction and finish are complete, our own team of professionals installs the cabinetry in your home. We will be here for years to come and are available for any further or necessary follow up work or projects. 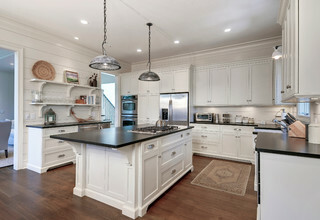 Copyright ROBERT PAIGE CABINETRY ALL RIGHTS RESERVED | Site by Analog Creative Co.